Even when faced with punishment, teens took a stand today. On Wednesday, students across the country walked out of their schools to demand effective gun control legislation. The protest is one of the actions organized directly after the school shooting in Parkland, Florida, which took the lives of 17 people at Marjory Stoneman Douglas High School. Students today walked out for 17 minutes to honor those lives. According to EMPOWER, the youth branch of the Women's March, over 3130 walkouts are scheduled across the country. 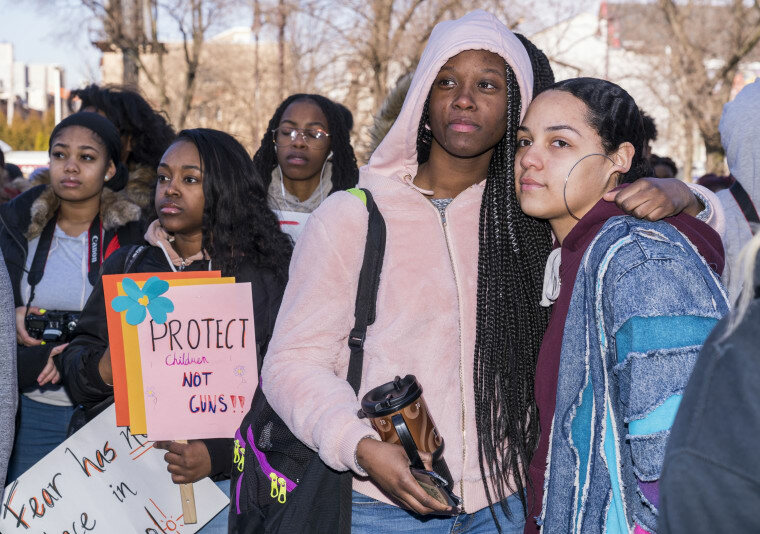 Several schools that have also faced school shootings participated, like Birmingham, AL's Huffman High School, where a student died from an accidental gun shot last week, and many schools are also allowing their students to engage in peaceful protest, or even walking out with them. Some students are participating in defiance of their school's threats of suspension or other punishment, even despite some extreme measures. The students at Georgia's Booker T. Washington High School were locked inside their school by administration; they fought this by kneeling in the hallways, likely inspired by Colin Kaepernick's protest. Another Georgia school also walked out despite threats of suspension. In New Jersey, Rosa Rodriquez walked out alone after her school threatened punishment. In a tweet Wednesday afternoon, Cameron Kasky, one of the most vocal leaders of the Marjory Stoneman Douglas High School students who organized the March For Our Lives, thanked everyone who participated, writing, "To the parents supporting their children walking out, thank you for raising this new generation of leaders. To the parents who didn’t support their children who walked out anyway, thank you for raising this new generation of leaders." Students facing suspension, expulsion, or arrest for walking out can call the National Juvenile Defender Center at 1-857-529-9373. See photos and tweets from the walkout below. More on @WCNC at 12pm: Sun Valley High School students risk suspension, walk out of class.